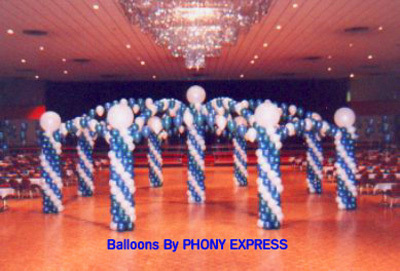 Six balloon & fabric dance columns, topped with silver moons and glowing with lights, define a dance floor at Aladdin Shrine. Internally lit, shaped 12 foot "castle columns" with turret tops and connecting arches frame a dance floor, creating a sense of intimacy in the cavernous space of the Columbus Convention Center. 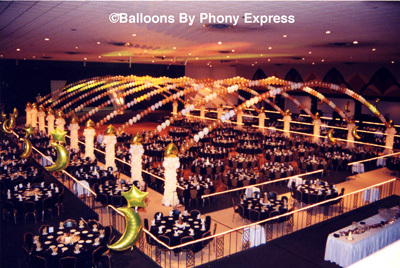 Star-topped spiral balloon columns with internal lights define the dance floor, while "single balloon" arches and glowing clouds create the feeling of a lower ceiling and more intimate dance space. 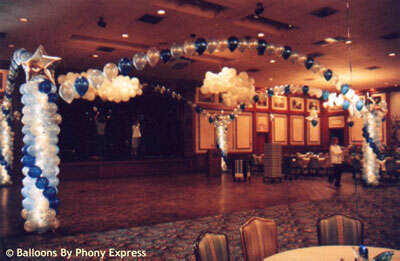 Silver lame' fabric swagging from the ceiling to the balloon columns creates an elegant dance area at Villa Milano. Aladdin Shrine is transformed by "single balloon" arches and glowing internally lit balloon columns. 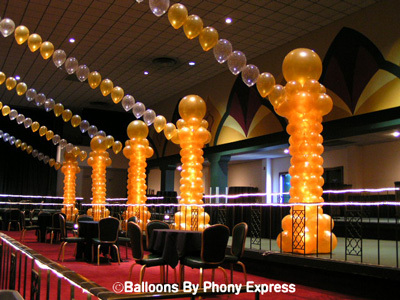 The use of multiple glowing balloon columns and arches creates a dramatic space for dining and dancing. 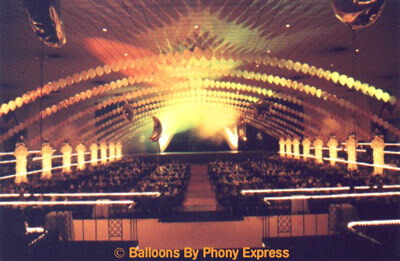 An aeral view of a large dinner dance event, seating about 1000 guests.